The nose has peach, honey, mango, caramel and then a little hint of lime. The mouthfeel is thin with no cling. The body has salted caramel, mango, honey and some sea air. The finish has salted caramel and peach with a hint of mango. Water brings out thin, rapidly expanding whorling that settles into brief mottling. The nose gains hints of orange and more caramel, and loses the lime. The body gains more caramel and some hazelnut nougat, and the mango becomes a little more intense. The finish gains more caramel. 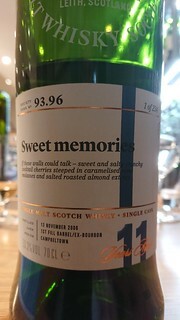 A superb dram, where the caramel, honey, nougat and sea air balance out the fruits.